On Tuesday, April 11th, William Dyson, of High Five Events, hopped on a phone call with Ross Moody, an Austinite, an athlete, CEO and Chairman of the Board of National Western Life Group, and a Trustee of the Moody Foundation. They talked about how the goals of Austin Gives Miles and the Moody Foundation align and also about growing up in small-town Galveston. You can see his accomplishments at the end! William Dyson – The Austin Marathon is appreciative that Austin Gives Miles was selected as a Moody Foundation grant recipient for the second year in a row. How does the Austin Gives Miles program align with the Moody Foundation’s philanthropic principles? Ross Moody – Austin Gives Miles aligns quite well with the Moody Foundation’s philanthropic principles in that AGM benefits present and future generations of Texans in numerous, varying ways, by providing financial assistance to organizations whose work supports education, social services, children’s needs, and community development in Central Texas. I picked up running late in life, but absolutely love it. WD – Normally grants are awarded to a sole entity. How does it feel knowing the Moody Foundation is positively affecting 26 Central Texas nonprofit organizations, all with different missions, through the Austin Gives Miles program? RM – It’s truly tremendous knowing that we’re positively impacting 26 Central Texas nonprofit organizations with varying mission statements. As a runner and volunteer, I’ve been involved with the Austin Marathon since the late-90s. I became aware of Austin Gives Miles when it was first created and thought it was a phenomenal way to support all 26 organizations at once. Awarding individual grants can be a time-consuming process. By working with Austin Community Foundations we’re able to bypass the difficulty that would be affecting each organization separately. It’s a win-win-win situation for Austin Gives Miles, the Moody Foundation, and all the communities impacted by the work of the AGM charities. Giving away money is the easy thing to do; the difficult part is for the nonprofit organization to use the money to fulfill its specific mission. WD – Going back to when the Moodys first arrived in Texas, why do you think the emphasis of community was, and still is, so important? RM – My family moved to Texas in the mid-to-late 1800s. They settled in Galveston, which was a thriving community at that time. It was one of the most energetic cities west of the Mississippi and the second largest point of entry in the country outside of Ellis Island. My family was fortunate enough to participate in the boom. My great-grandfather had many interests, including banking, insurance, cotton brokerage, and printing. He knew his businesses wouldn’t survive without the surrounding community. My great-grandparents treated people the way they wanted to be treated. They were hard workers, but also knew at the same time they wouldn’t be in the position they were in without the community. The Moody Foundation was created by my great-grandfather’s estate. Through their will, my great-grandparent’s gave the lion’s share of their fortune back to the community through the Foundation. They wanted to support the community that supported them, focusing strictly on Galveston and the State of Texas. WD – If your ancestors could see the Moody Foundation in its current state, what do you think their reaction would be? RM – I believe they’d be astounded at the growth and the amount of giving by the Foundation. Since its inception, the Foundation has awarded $1.3 billion through more than 3700 grants. Our giving has increased during the past 10-15 years and we award $60-70 million annually. We continue to do what my great-grandparent’s set out to accomplish, that is, to positively impact the State of Texas and its citizens. WD – You’re a self-proclaimed small-town kid from Galveston who moved to Austin to attend The University of Texas. 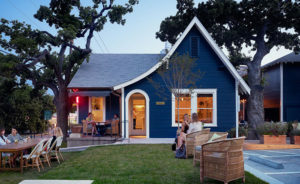 What attracted you to Austin and UT? RM – When I was in high school, I was given three college applications when I was a senior. Back then, applications were one page long. The applications were to the University of Texas, Texas A&M, and the local college in Galveston. My brother went to UT so I followed him. In the early 80s Austin was a fantastic city. Even though Austin was 4-5 times the size of Galveston, it still had that small town feel. It felt like I went from one small town to another; it was my home away from home. WD – You’re an 11-time finisher of the Austin Marathon. What drew you to run in this event? RM – This is Austin’s signature running event. It’s in our back yard. It’s always been a well-organized event and one that’s representative of the City of Austin. When I first started running I trained by myself, running multiple loops around Town Lake. I wasn’t aware of the local groups or clubs. I didn’t know about the various routes around town. But then I joined a running group. I met people and trained with those people. I dove further and further into the Austin running community. We pushed each other, my times dropped. Next thing I know I’ve finished the Austin Marathon 11 times, being a pacer for at least half of those races. WD – Are you still running? RM – Not at the moment. I have a recurring Achilles issue and had surgery to remove a bone spur. I’ll get back into running, but I need to ensure my Achilles won’t act up again. I love running because it removes barriers and strips you down to your purest form. The only thing that’ll get you across the finish line is hard work and determination. WD – What have you learned during marathon training or in running the marathon itself that you applied to your professional life? RM – Two things: discipline and teamwork. You must be disciplined to succeed. You must be disciplined in your training in preparation for your race. You must be disciplined at work in order to be your best self and help the company succeed. Teamwork is probably the most important; it’s more difficult to do tasks alone. It’s better to work together. Accountability is a major factor in success, whether you’re getting up at 5 a.m. to meet your run group or you’re tasked with a specific responsibility and your company is relying on you. WD – What’s the probability that you’ll train for and run the 2018 Austin Marathon? RM – HA! Right now it’s at 0%. When I do another marathon it’ll be in Austin. There’s just too much going on in my life right now. I don’t feel like I can dedicate enough time to properly train. My work/life balance is at a good spot right now, training would throw everything off balance. WD – If you could give one piece of advice when it comes to running what would it be? RM – Find the pace that works for you. So many folks can’t find their pace. They hit it too hard early on and then blow up later in the race. As a pacer, we had a shirt that said, “It’s the pace, not the race.” I like that expression. Folks have asked me for advice and I always say don’t try to kill it early, run at a comfortable pace, and believe that you can finish. Push it at the end if you feel good. WD – Considering all of your professional and philanthropic endeavours, what do you do to find time for yourself and your family? RM – It’s easier now that my kids are grown. My daughter lives in NYC and my son is at UT. I think what’s most important is to find a balance in your life that works best for you. You can’t ignore your personal life to the detriment of your professional life and vice versa. I love my “Ross time.” When my kids were younger I still had to get my runs in. It’s all about planning and discipline. If needed, I lined up a babysitter to watch the kids while I was on a run. Don’t forget about your friends and family. That’s what makes me equally balanced at the end of the day. WD – What will Ross Moody do and where will he be in five years? RM – I’d like to find more balance professionally. My family time and personal time are taken care of. I want to make sure that certain responsibilities are well-managed and in capable hands. I’d like to back off some from the for-profit side of things and focus more on nonprofit tasks. In order to back off the day-to-day responsibilities I’ll need to hire the right people and continue to form strategic partnerships. RM – 1) Hands down the birth of my kids. Being a father is a fantastic experience. I love my kids. They’re smart and funny. We have a great relationship and I’m proud of what they’ve become and am excited about what they will do in the future. 2) Various athletic accomplishments: running the Scottsdale Marathon in less than three hours, finishing Ironman three times, completing the Grand Canyon Rim-to-Rim-to-Rim. 3) Realizing that I’ve stepped into my father’s footsteps. I’ve been challenged to meet and exceed his expectations, to continue to be inclusive of my family as my dad was with all of us. I’ve been fortunate to have the experiences I’ve had throughout my life and I just want to make my father proud. RM – Town Lake. It’s the first place I ran in Austin. I continue to go down there to this day. I’ve spent years on the trail and it has become my go-to place. RM – Visiting my ranch in the Hill Country. WD – Friends or family come to Austin for a visit. Where’s the first place you take them? RM – I feel like people need to view Austin as whole and not in specific places. 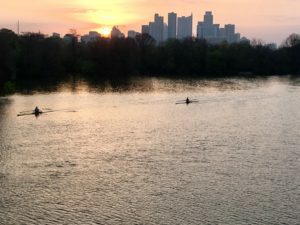 I like to give people the Austin experience: spend time at Town Lake, visit the Warehouse District, visit the stores on South Congress, boat on Lake Travis, etc. There are so many great things about this city that if you focus someone’s visit on one place then they won’t get the full feel of Austin. WD – Mr. Moody, thank you for your time today and for your and the Moody Foundation’s continued support of the Austin Marathon’s Austin Gives Miles program. The impact the grant makes is truly widespread and affects tens of thousands within Central Texas. When you get back to running you’ve got an open invitation to join the High Five Events crew for all of our excursions! Wishing a speedy recovery. Completed three Ironman competitions and numerous other marathons, including multiple Boston Marathons and one in Antarctica. *Feature photo from Moody College of Communication – The University of Texas at Austin. The Austin Marathon® presented by NXP is proud to announce that the 2017 Austin Gives Miles program, its Official Charity Program, raised more than $637,000, far surpassing its $500,000 fundraising goal. The 26 Central Texas nonprofit organizations accepted into the program worked tirelessly to exceed the program’s fundraising goal while increasing awareness for their organization and recruiting race day volunteers. Hope4Minds, an organization that supports children with an acquired brain injury, was the highest fundraiser, raising more than $41,000. The money raised significantly impacts Central Texas and the communities the charities serve. For the second year in a row, Austin Gives Miles was the beneficiary of a Moody Foundation grant that matched donations for each organization, up to $10,000. You can review the 2017 Austin Gives Miles charities and their fundraising efforts on the Austin Marathon website.The 2018 Austin Gives Miles application process will open on June 1.